Los Angeles quartet Moira and VOCO treated all of us to a National Championship performance at the 2007 Harmony Sweeps Finals in San Rafael in May, and "Blink" only expands and deepens our appreciation for this all-woman group. Moira's sure songwriting and arranging touch is everywhere on this gem of a recording, which features her original tunes "Deep Blue," "I Live in California," "Stand in that River" (which also won for "Best Original Song"), "Our time/Shout," and "How Can I Cry." Another winner from their Finals set is "Dying Californian," a beautiful, haunting folk song from "the Sacred Harp" (1859). Other winners are "Katie Cruel," here lightly accompanied by percussion, cello and accordion, "Dance s'loyfn, s'yogn," with Moira's words given to a Yiddish dance song, the surprising "Firecracker Girl," "al' procia" and "esik eso," Croatian and Hungarian folksongs. And, unique to this group, which they showed off at the Finals, are a pair of fun, short "body percussion" songs, "the Boat BP" and "Tryptophan Hand Jive." 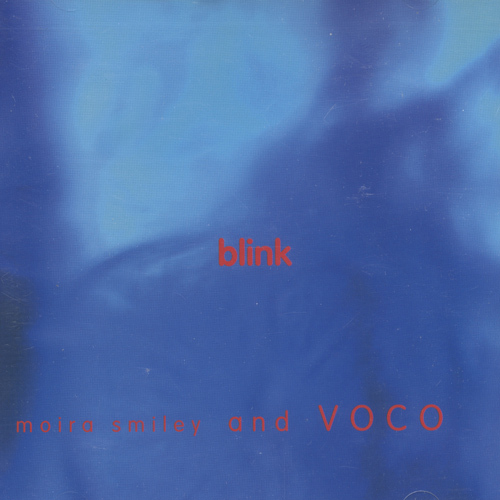 Moira and VOCO are fast-rising stars, and "Blink," like their Finals set, touches and moves us.